With 3 reels, and 1 pay line. You can bet a maximum of 3 coins, with the coin value set at 50 cents. 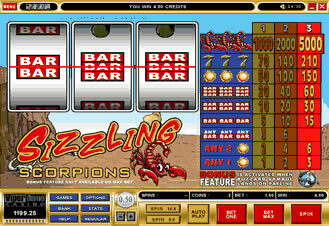 The highest jackpot that you can win here is 5,000 coins. To get to the bonus screen you have to make the maximum bid, which is only $1.50. Compared to the other bonus feature slot machines, this is only half the cost. The bonus screen is activated when you get the bird symbol on the pay line. This is only seen on the third reel. When you do get the the bonus screen you get to pick your bird, and watch the bird race. You will always win at least 30 coins on the bonus screen. You will win weather or not your bird wins. With the top prize being 100 coins.